This is a Folded Paper Frame on a 5 1/4" card base. Melissa at Tuesday Morning Sketches gives a link to Splitcoast Stampers so that you can get the instructions to join in on her challenge this week. My new little Inkadinkado stamp set was just perfect for this technique. I'm still corner challenged when I'm sewing the zig-zag stitch, but that would mean I need more practice. I would also like to give you a little hint, which is not original to me, but here goes. The scallops around my sentiment oval are punched circles placed around the edge, so you can put scallops around everything with this technique. Pretty cool, huh? Supplies: 5 1/4" Square River Rock card blank, Papers: Stampin Up-Night of Navy, River Rock, Designer Series Paper Prints Certainly Celery sponged with River Rock ink, Designer Series Paper Pattern Stack Subtles, Stamp: Inkadinkado-Spring Mini Clear Assort., Ink: Stampin Up-Night of Navy, River Rock, River Rock marker, Spellbinders Nestabilities-Classic Scallop Squares Lg. , Stampin Up-Scallop Trim border punch, Marvy small circle punch, Coluzzle Oval Shape cutter template, sewing machine, Stampin Up dimensionals. I love how you framed the image! I'll have to try this sometime!! Lovely card! I just love your design! A very pretty card. 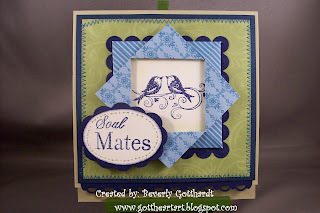 I really love those little birds in the frame - gorgeous! Your card is just adorable. Love the framed little birdies! Fabulous creation. This is adorable!!! I love it! Thanks for playing in the Color Dare! Really pretty! Love your stitching.... Thanks for playing along with us at Tuesday Morning Sketches! Very nice - I like how you've framed the birds. Thanks for playing along with the Color Dare. Very sweet card Beverly. I love it! Thanks for joining us at Tuesday Morning Sketches. Beautiful! Love your folded frame! Thanks for playing along with the Color Dare!